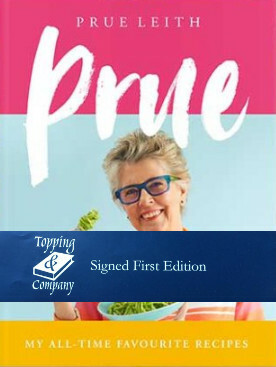 Home » Books » Prue; Signed by Prue Leith; First Edition. Great British Bake Off judge Prue Leith draws on a life-long passion for food with one hundred recipes from her own kitchen table. Whether it’s Halibut with Green Linguine, Fast Roast Teriyaki Lamb or Slow-cooked Rat-a-tat-touille, these are delicious, fuss-free dishes that Prue has cooked countless times for family and friends.